From the same breeder of the ever-popular Knock Out family of roses comes the White Out Rose. It is much like the Knock Out Roses but produces an abundance of white flowers from April to frost on disease resistant bushes. Not quite as disease resistant as the Knock Outs but close. If you plant it in locations that provide well-drained soil, and ensure the plant will receive morning sun, there shouldn't be any problems with disease. The White Out Rose is easy to grow and do not require any special care. This rose is self cleaning so there's no need to deadhead unless you want to. 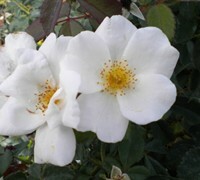 The White Out Rose is winter hardy to USDA Zone 5 and heat tolerant throughout the entire U.S.. It thrives in almost every area of the country. In the coldest regions they will need winter protection. The White Out Rose can fit into any landscape. 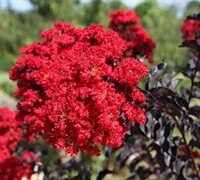 Plant individual among other shrubs, in small to large groups, or as a low-maintenance hedge. Plant the White Out Rose in locations that provide well-drained but moist soils and full sun to part shade. Morning sun is a must for all roses. Six or more hours of sun is best. To keep your White Out Rose full and bushy from year to year prune the branches back to about 15-18 inches above the ground in late winter or early spring.